Another sequel to a fifteen year old movie, Crouching Tiger, Hidden Dragon: Sword of Destiny is a pale shadow of the original. But the original was a pretty great movie, leaving a lot of space for this one to be a pretty good follow up. Again, it has to do with the sword Green Destiny and the attempts of various people to gain control of this powerful sword. The only returning character from the first movie is Michelle Yeoh’s Yu Shu Lien and the rest are new, though many of them have connections to characters from the first movie. Sword of Destiny lacks much of the previous film’s complexity, being a much more straightforward melodrama. The finely choreographed fights and some beautiful scenery help to buoy somewhat leaden dialogue. Crouching Tiger, Hidden Dragon: Sword of Destiny is weightless but attractive. 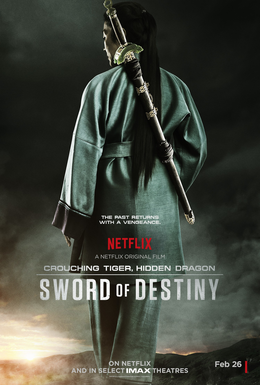 Released via Netflix on February 26th, Sword of Destiny continues the story of the Green Sword. After its protector dies, Yu Shu Lien comes to pay her respects to an old friend. While there, an attempt is made to steal the sword. Two thieves, Snow Vase and Wei-Fang, fight over the sword and end up captured. He is sent to a cage and she begs Shu Lien to train her. Finding out that the evil Hades Dai is after the sword, Shu Lien’s presumed dead, by the hand of Hades Dai no less, ex-lover Silent Wolf recruits a group of warriors to help protect the sword. The story is melodrama and not especially deft melodrama, but it is reasonably effective. Sword of Destiny is at its worst when it is deliberately echoing the first film, since it can only suffer from direct comparison. However, it soars when it steps out of the first movies shadow. The scene where Silent Wolf goes looking for recruits is a highlight, playing out with a more comedic bent as it introduces a quintet of idiosyncratic martial arts masters. It turns into something like a riff on Seven Samurai. However, the repeated tale of thwarted love feels lacking. The same goes for the recitation of the younger protagonists’ tragic pasts. That Sword of Destiny coalesces into a more straightforward action story, while slightly disappointing, is to its benefit because it succeeds on those terms quite well. Sword of Destiny smartly keeps the action coming quickly, spacing out some of the limp drama with very well-choreographed fights. The aforementioned recruitment scene is a highlight, as is a three way fight on a frozen lake that sees all combatants sliding around on the ice. Again, I don’t know that the fights are quite as good as the first movie (I can’t say for sure because it’s been a decade since I’ve seen it), they are all highly entertaining. Crouching Tiger, Hidden Dragon: Sword of Destiny seems stuck in a miserable place. It likely only got made because of its connection to the highly successful Crouching Tiger, Hidden Dragon, but what is most damaging to this movie is the inevitable comparisons to the easily superior original. It will be judged against that movie and be found wanting. Judged on its own merits, it is still not spectacular, but it is a fun, lightweight movie. I don’t know, I know it is an inferior movie, but I am having a hard time separating that fact from how much I actually enjoyed watching this.